Elwyn Augustus ‘Jack’ Lynn (1917-97) was a self-taught painter whose contribution to twentieth century art and culture in Australia cannot be overstated. Lynn’s achievements and influence extend well beyond his impressive oeuvre of modernist paintings. Lynn was a trained secondary teacher, working as an educator within several Sydney high schools up until 1968. Lynn also emerged as an outspoken arts commentator, during the fifties and sixties he edited the broadsheets of the Contemporary Art Society, an anti-establishment organisation that was articulate in its opposition of the prevailing conservatism of the era. As Robert Hughes noted in The Art of Australia (1966), Lynn “kept up a running skirmish with prevalent attitudes in Sydney – the gentility of the Charm School came under constant attack – and stimulated discussion about international issues in art.”** Lynn’s views were also represented in a range of high profile national publications. He worked as a critic for a number of newspapers, including the Sunday Mirror, The Bulletin, Nation, The Australian and The Weekend Australian. It was his great honour when was appointed editor of Art and Australia. In 1971 he became Advisory Editor of Art International, at the nexus of contemporary art theory and featuring the most exciting artists living artists. Beyond his influence as an educator and critic, Lynn’s remarkable position in emergent Australian arts culture, was further consolidated with his appointment between 1969 and 1983 as Curator the Power Gallery of Contemporary Art at Sydney University from 1969 to 1983. There he built up an international collection, which is now within the Sydney Museum of Contemporary Art. Lynn was also an author of several important books on Australian art and artists, including the iconic ‘The Australian Landscape and its Artists’ (1977) and the famous monograph on Sidney Nolan (1917-92), ‘Sydney Nolan - Australia’ (1979). Lynn has written many more books, notably further monographs on Frederick McCubbin (1855-20) and Judy Cassab (1920-2015). Of course, together with these impressive accomplishments, Lynn also achieved acclaim as an artist. His career as a painter started in the forties. While Lynn delved into a range of subjects, he is best remembered for his unique abstraction, particularly representations of landscape. Unlike many of his contemporaries, he has been compared to Fred Williams (1927-82) and John Olsen (1945-2001), Lynn’s landscapes are rarely literal. They are unmistakably about place; the emotion; the physicality; the palette. Lynn’s oeuvre is a treasure trove of imagery inextricably linked to culture, identity and humanity. He effortlessly enacts a complex play of texture and earthy tones in his work. Lynn’s travels, commencing with a trip to Europe in 1958 injected new imagery and bolder colours into his work. Inspired by such artists as Jean Dubuffet (1901-85) perhaps most in terms of the use of unorthodox materials such as sand and tar, used to create an impasto effect. Lynn was awarded Membership of the Order of Australia in 1975. He won the Wynne Prize at the Art Gallery of NSW in 1988 and the Blake Prize twice. In 1989, he received an Honorary Doctor of Letters from the University of Sydney. In 1994 he received the Emeritus Award from the Australia Council. In 1991, the Art Gallery of New South Wales mounted a comprehensive Retrospective Exhibition of his work. ‘Elwyn Lynn: Metaphor and Texture’, a major study of his work, was published by Craftsman House in 2002. * Crawford, A., ‘Elwyn Lynn: Abstract Renown’, Art Collector, Issue 30, October - December 2004, np. 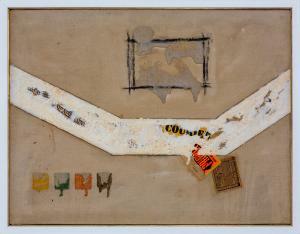 **Robert Hughes cited in Crawford, A., ‘Elwyn Lynn: Abstract Renown’, Art Collector, Issue 30, October - December 2004, np.